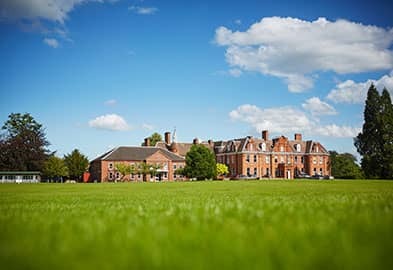 Moor Park is a co-educational country prep school in a beautiful setting in the Shropshire countryside, combining outstanding academic and extra-curricular success, with a culture of kindness founded on Catholic principles. The Prep School starts for children in Year Three and ends in Year Eight when children leave Moor Park to go to the senior school of their choice. The prep school is split up into the Middle School for Year Three to Five when children have a Form Teacher in charge of their pastoral care and academic progress and the Upper School from Year Six to Eight when children have a Tutor who guides them through the last three years of Moor Park. Each Tutor group is no bigger than ten pupils and is made up of children from Year Six to Year Eight. The curriculum is broad, offering challenge and opportunity for all: confidence can often grow from success in a small part of school life. Year Three follows naturally from the Pre-Prep, with much emphasis on literacy and numeracy, taught by the form teacher. As the children rise through the school they develop greater independence, being taught by subject specialists, enjoying a broad curriculum which includes, for example, classics, It & Computing, and PSHEE/Citizenship. French is taught in the Pre-Prep but becomes almost a core subject as children reach Year Four. Children start learning Latin in Year Five and Spanish is introduced in Year Seven. Children go on overnight camps and trips every year with a week in France in Year Seven and a week of outdoor adventure in Year Eight. It is our belief that residential trips enrich children’s education and personal development. Year Eight is very special. Pupils are trusted and given responsibility, whether it be Head Girl, Captain of Cricket, or escorting the Pre-Prep children from the bus to the classroom in the morning. They are expected to take responsibility for their learning and to manage their own time. They flex their adolescent muscles in an environment that supports them through this sometimes difficult period of their lives. Pupils leave for a wide range of nationally known Senior Schools – as individual as them. Almost without exception, they gain places at their first choice of school. A good number win scholarships which may be academic, artistic, sporting, musical, or ‘all round’. In recent years our pupils have won academic Scholarships to Harrow, Rugby, Shrewsbury, Cheltenham Ladies’ College, Oundle, Malvern College, Moreton Hall, Christ College Brecon, Monmouth, St Mary’s Calne and Ellesmere.